Water is a third person puzzle solving adventure type of game with an unique look and gameplay. It’s a story about a mermaid, and fish men who aren’t fish men. A story that brings you into tears and fears. It’s about fish people, harp instruments, swimming, and crazy priests. Copy the water folder into your SourceMods folder. Water should now be listed in your Library tab. You know I love what I know and know what I love, right? Well, I didn’t love this and now you know it. It’s an amazing piece of work, that everybody should play, or at least start to play. Basically, if you don’t like the first 20 minutes I don’t think it will grow on you. I found the controls fairly easy to use but some of the puzzles were a little strange. I apologize for the short and unhelpful review but I played it in October and got 3/4 the way through before having to stop; partly because I wasn’t enjoying it and partly because I got busy. So, you must try it and unlike me, try and keep an open mind, you never know it may become a favourite of yours! I’ve already played it when it was released. The quality is so High That it could be compared to modern retail adventure games. Au-Heppa and his friends have done such an amazing job That it virtually brought me down to my knees to shout “Respect!!”. I know this isn’t a mod very reprsentative of Phillip’s tastes, but you should be shameful, people, to not at least give it a try. I’m also impressed that this mod, even being “short”, is only 290 Mo… I’ve eaten so many mods with custom content being between 1 and 2 Go that this was really a blow of fresh air. 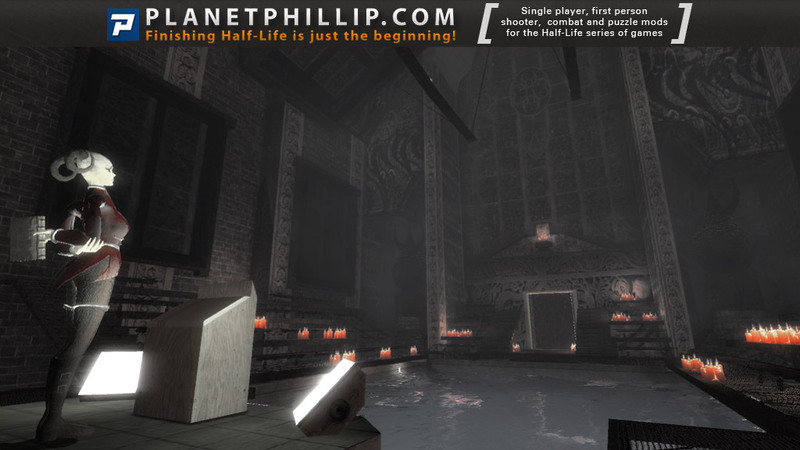 Being born from the alliance of the HL Short Stories team and Matt Bortolino (the developer of Research and Development, but this time he had only a part in the “artistic”), Water was highly expected, and as I remember when it was first released on moddb, it encountered a bit of defiance from die-hard HL fans, wondering why they should play a siren as they usually played big brainless shooters. This is here that I see the flaws in the “first-person shooters”, and some kind of schizophrenia from the fan bases, who at the same time praised (perhaps a little too much) Stanley Parable and Dear Esther, but dismissed a bit such mods as Water, but in the end it’s the same : doing different things with the Source engine, it’s free, it’s for us, and for all of the hard and amazing work, it should be at least tried once. This is also here that I can see what seems to be an unconscious rule in the most brilliant teams : they don’t like to stay in the same “thing”, for example, Lord with EOTS moved to the CryEngine to try different things, Magnar Janssen delayed Mission Improbable 3 to work on the idea of Whoopservatory, and HL SS has delayed (undefinitly?) Human Error 2 to work on their Water project, and then Last Zombie. This is interesting on how they can left the work, the saga, that made them known to the fans, just to work on new ideas of gameplay, even if it usually means they will maybe face disappointment and loss of interest from the mod players. I played this when it first came out and a further five times now. 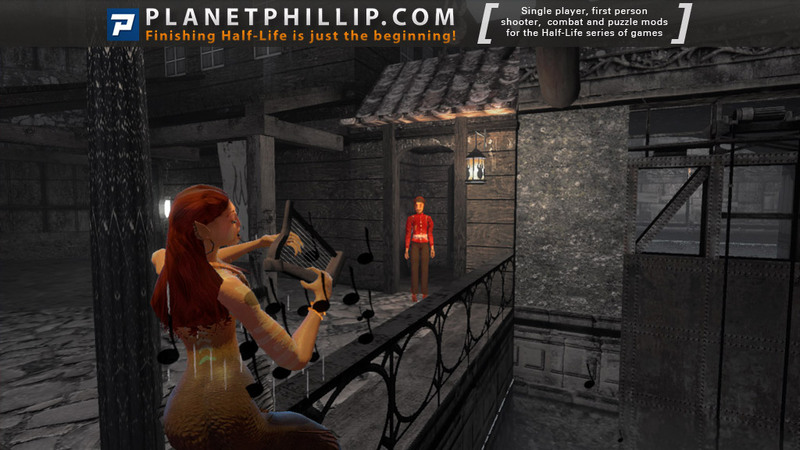 A novel slice of fantasy from the HL2 universe and the Short-Stories team. it’s a well-crafted game full of colour, interesting puzzles and some odd combat! I was joking about the colour bit. What a dull existence for the fishy folk! Interesting use of speech bubbles and turn based combat make this rather different to what I’m used to. And I like the way “Water” can posses the fishy folk! Interesting and fun, with some head scratching for good measure and the return of a Half-Life buddy! Not a buddy per says, more of a scary monster! The music is so well matched to the game it weaves into the surroundings, colouring the gloomy world. I must say that the sideways swimming motion of “Water” is an inspired departure from the usual mermaid stroke! 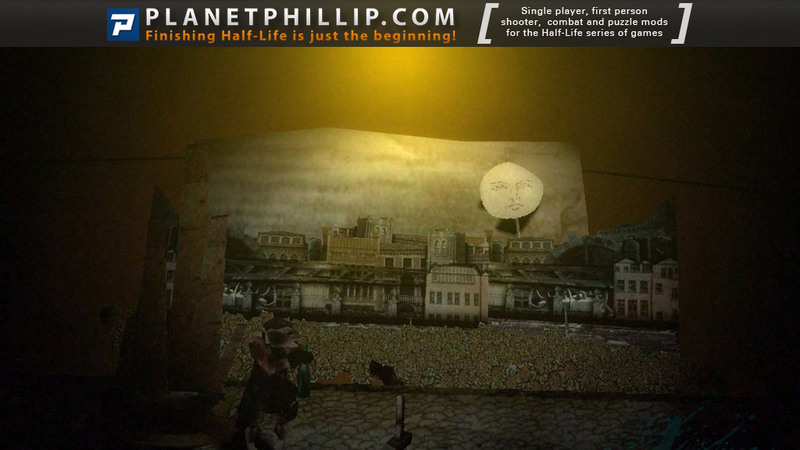 I did not think I’d be throwing toilet rolls when I first played HL2! Great fun stuff and a nice break from the usual endless gunplay mods. Oh; there is gunplay in it! Well it’s finally at Planetphillip! Gotta say I even did a Russian translation for this wonderful mod, you can find it at moddb page if needed. At first I was like “Ah, again some art house mod, going to be pretentious and boring as always”. Boy I was wrong! The most exciting adventure game since “The Longest Journey”. And I don’t like adventures at all! The art style is wisely done and atmospheric. You can clearly say – Water is belong to water, pardon the pun. Then she’s outside every color is desaturated – dry land is an alien world to her. Even more – she’s flying like a dolphin under water and she’s completely helpless on a dry land. Brilliant achievement in immersion! I even got a “horror feeling” with growing tension at one part because I was outside water too long. The puzzles is not overcomplicated and most important thing – they are interesting and sometimes hilarious to solve. There’s nothing you can’t handle. At the same time they utilizes Water’s unique abilities at max. I won’t spoil anything to you but couple of puzzles made me LMAO like a madman. And the specific sense of humor of course. The reason for Water’s quest alone is enough to make you grin like a Joker. Not to mention further jokes. So far the mod is polished as it was a retail game. At least I was not experienced any technical problems. The only thing I want to see or more exactly to hear is a full voice over. It will add even more charm into this piece of gamedesign art. I’m not counting the intro, it was… uh… not very inspiring. So download it and play it, it will take only 2 hours at max, but you will enjoy every second of it! P.S. By the way guys, Cry of Fear releasing today! Well I have to say I played this quite some months ago, and as the general recommendations, I liked it and I also found this mod as a very good work from a dedicated and smart modding team. The first thing it really catched me on this mod it was the beggining that open and almost endles ocean where you can swim inside, it was beautiful, and overall I also think this mod feels like an almost retail professional release which states that is a really good stuff to play because there is quality on it. 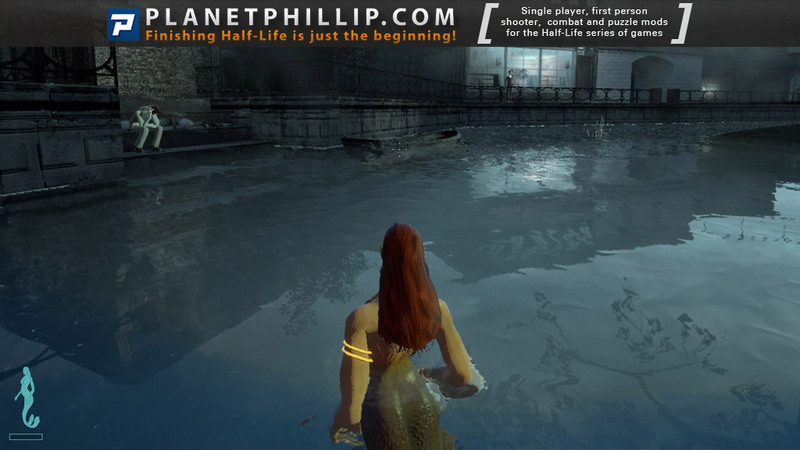 Also, as far as I know this mod is directly or indirectly related to the develop of Human Error mod, and another fantastic and must play mod this is a survival horror called Flesh, that one is also in third person and the feeling and quality when you play it is almost the same as this water mod, so if you have time I highly recommend to try Flesh along with this family of good mods related each other in the devellopemnt. The story and interaction is powerful and atractive, controls sometimes can be tricky but it defenitely worth it when you explore each and every corner of the maps provided. I liked that mistery fun entrtaining halo in the whole atmosphere of the mod, and I defenitely will try the further development of the mod if its going on in the future. In conclussion, this is a very good example of how source engine can be hard to work with for some modders but definitely is a really rich engine to create original fresh storys and new gaming worlds wich is great, also Water is the perfect mod to relac and get out of the mayhem combat HL universe. Without going in as much depth as the other reviews, this is possibly one of the most impressionable mods I’ve played in a while. The starting area in the caves is also masterfully crafted, my god it looks nice. I loved it…all that swimming around the harbour was great…I got to see a harbour gate that was never going to let me through, I beat up some wierd dude…swam around some more…great excersise…..a fine game ! Just one questoin…err…what happens next and when ? I must admit I was ready to hate this because it was so unusual, but after playing for about 15 minutes I was hooked (not literally!). Great concept and actually quite fun. I had a problem with the skeleton freaking out near the end, but I found a command on the ModDB page to bypass that section. I wish there were more autosaves as I only played 1 of the 3 possible endings and was too lazy to go back. This is definitely worth playing and will go in my “Great Mods” folder! In the fight with Fire, what makes her leave the room? How many times do you have to hit her? What is she trying to do? I finally completed this mod. I’m a serious combat player, but I gave it a chance and found it to be enjoyable. I guess it was how the mod played that fascinated me. Because I had to see what was going to happen next. I do think that most guys that like alot of combat may shay away from this mod. So, I gave it a MAYBE as a warning to guys like me. If it doesn’t grow on you from the start, you won’t like it. A NOTE TO AUTHORS…NEED MORE MODS WITH GOOD COMBAT, PUZZLES AND PLOTS. SEEING LESS AND LESS MODS BEING CREATED. Yeah I definetely agree with U less and less being created, is kind of bad stuff, but I hope things improve in the middle of 2012, Cry ofd Fear was great but even tough is pure horror in there, we need to get back to tha basics as u said HL pure combat amazing mods we need that. Get Back to the roots I agree!! In short: Beautiful environments, quirky and bright presentation, lots of clever ideas well implemented. Puzzles are similar to those found in the old style adventure games (for better and worse) Charming, well made mod and there is none other like it. The introduction was a narrator who performed reasonably well, considering the rest of the mod is doesn’t use actual words it is definately the best voice acting in the game but the audio effect adds an echo effect which leads me to believe that he was supposed to be sound kind of mystical which he doesn’t quite pull off, but it is fit for purpose and the drawings are cool. You play a mermaid and although as a concept it honestly sounds kind of crap but these guys ran with it and they pulled it off and now I get to enjoy skipping across the ocean like a dolphin without a care in the world. The beginning area is especially beautiful but the whole mod looks good, there is a quirky kind of Double Finesque art style with puppet theatres, bright and colourful characters. This mod is so alternative it hurts! The combat is kind of turn based strategy more akin to Monkey Island than Final Fantasy which at the start is funny but later on in the mod as the opponents get more difficult it can become a war of attrition, fortunately the game favours puzzles which are creative, fun and constantly fresh although often based in adventure game logic. But the mod does a good job of teaching you the tools you have at your disposal and you have to make a pretty concerted effort to die seeing as the water heals you so the cost of failure is never too frustrating though sometimes the slightly awkward controls are. This mod is pretty much a game in its own right, very high production values for a mod. i know im probally on my own with “play it later” however I just wasnt impressed with this mod… that said its well designed and unique but maybe its me but im a old school single player guns and rockets…. its by no means a bad mod… far from it….. however in my opinion hl2 mods are getting too removed from what we are used to…. come on leon… lets have another masterpeice ! I thought I’d give this a go because it sounded and looked interesting. I enjoyed the visuals and animation, and the contrast between the dry land and the underwater world, and some of the other art styles being used, like when the fisherman is telling you the story of his new eyes. Even though it’s not my kind of thing I would recommend that people who haven’t tried it give it a try at least. 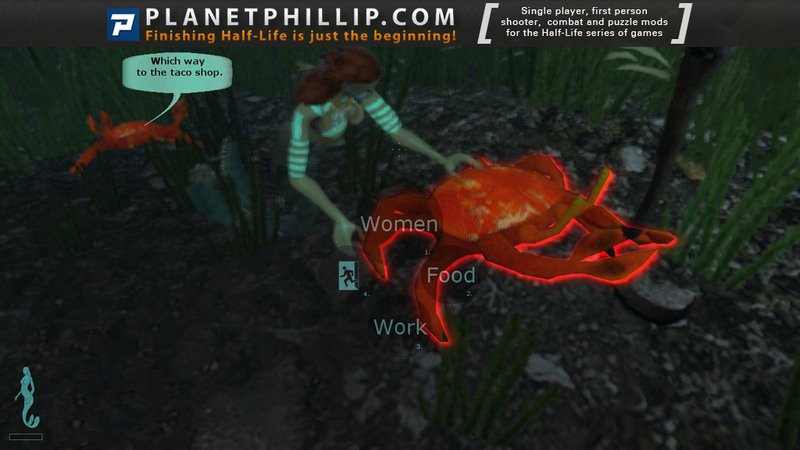 it not mod for Half-Life 2. It is a separate product on SourceEngine.